Cracks have surfaced in Telangana movement with the ruling Congress virtually shutting the doors on the all-party Joint Action Committee (JAC) whose call for en mass resignations of elected representatives from the region has failed to make much impact. Kanchi Shankaracharya Jayendra Saraswathi has landed in a political controversy by opposing the demand for a separate Telangana state. Prime Minister Manmohan Singh today told his Cabinet colleagues that there was no change in the government’s policy on Pakistan as several ministers got agitated over a reference to Indo-Pak relations in the address that is to be delivered by President Pratibha Patil to the joint session of Parliament next Monday. The government has extended visa for controversial Bangladeshi writer Taslima Nasreen by one year. She has also moved for permanent residency in India. Bofors might sound ‘ominous’ for the Indian polity, but the 155 mm artillery gun made by the company is considered to be one of the finest in its category, and is now back in India. 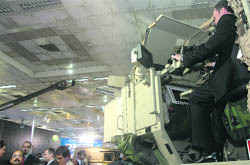 It is currently on display at the ongoing 6th Defence Expo 2010 here in the National Capital. 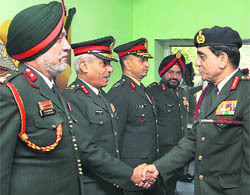 Chief of the Army Staff, Gen Deepak Kapoor, visited the headquarters of Western Command at Chandimandir today. Gen Kapoor was received by Lt Gen SR Ghosh, the GOC-in-C of Western Command. Lt Gen Ghosh later briefed the Army chief on various operational training and administration matters. The CPI (Maoists) extended by 24 hours its deadline that ended 6 pm today for fulfilment of demands to set free the abducted BDO of Dalbhumgarh even as the Jharkhand government agreed to relook into the allegation that some persons were "falsely implicated and arrested". The Indian Institutes of Technology (IITs) can’t offer medical courses on their campuses, not yet. Meeting in the Capital today, the expert committee, constituted by the Health Ministry to consider the proposal, resolved that the permission could not be granted. The government has allowed mills in Uttar Pradesh to sell raw sugar imported by them, but lying at various ports because of a ban, to mills in other states. Nine UP Police personnel were suspended from duty today for allegedly causing the death of two persons in custody while one was struggling for life. The Delhi High Court today refused to give early hearing to Congress leader Sajjan Kumar’s plea for anticipatory bail in the 1984 anti-Sikh riots cases. Kumar, who is facing the threat of arrest for his alleged involvement in the cases, approached the Delhi High Court pleading that his plea for anticipatory bail should be urgently heard in view of tomorrow’s proceeding in the trial court that has sought his personal presence. Even after 24 hours of Maoists’ carnage at a police camp in the Jangalmahal area yesterday evening, in which 24 jawans and a student were killed, neither the Central forces nor the state police, participating in the joint operation against the Maoists, have been able to arrest any of the Maoists involved in the action so far. Nor could they ascertain their whereabouts. As many as three labourers were killed and seven others injured in an explosion in a steel factory at Kapsi village near here today, the police said. Two British nationals were detained by security agencies after they were believed to be indulging in suspicious activity. Following the German Bakery blast in Pune, a high alert has been sounded in Pushkar with specific inputs to ensure the safety of Chabad House, a community centre of Israelis in the holy town. The police have beefed up security at places reportedly frequented by US terror suspect David Coleman Headley during his week-long Goa visit last year. Though all the constituents of the JAC unanimously rejected the terms of reference (ToR) of the Justice Srikrishna Committee, set up by the Centre to go into the statehood demand, they differed over the issue of quitting the posts in protest. While JAC appeared to be heading for a split, the pro-Telangana student agitators showed no signs of slowing down their protests. The police action against the students at Osmania University campus here yesterday rocked the Assembly today, leading to its adjournment for the day without transacting any business. The deadline for resignations set by JAC, comprising representatives from Congress, Telangana Rashtra Samithi, Telugu Desam Party, BJP and Praja Rajyam Party, ended last evening. Barring two legislators, R Damodar Reddy and Ch Muthyam Reddy, the Congress members ignored the call while all the 10 TRS MLAs put in their papers along with one member each from TDP, BJP and PRP. “We are out of the JAC as it has become a pocket borough of TRS. We take strong objection to its unilateral call for social boycott of Telangana leaders who do not resign from their posts. We will not quit but will continue to pursue the statehood cause,” the convener of Congress MPs Forum, P Prabhakar, said. Daggers were out in the JAC camp with Congress leaders accusing its convener, Prof M Kodandaram, an academician with no political affiliation, of acting as “spokesman of TRS” instead of taking all parties into confidence. On its part, the TRS hit back at Congress for clinging on to the positions of power at the cost of Telangana cause. “By refusing to resign, the Congress has exposed its true colours, the TRS floor leader in the Assembly, E Rajender, said. Meanwhile, in a tactical move, the TDP has sent resignation letters of 35 of its MLAs from the region to the JAC convener and said they would be submitted to the Speaker, N Kirankumar Reddy, only after Congress legislators put in their papers. The Speaker has accepted the resignations of all the 10 TRS legislators and one each from TDP and BJP. The Telangana region, comprising nine districts and Hyderabad, accounts for 119 legislators in the 294-member assembly. The Congress has 50 and TDP has 39 legislators. The BJP and PRP have two legislators each. Meanwhile, the two Congress MLAs who had submitted their resignations have been summoned to Delhi by the party high command. The central leadership will ask them to withdraw their resignations as such actions would lead to constitutional crisis and push the state towards President’s Rule. A majority of the Congress leaders are of the view that the resignation strategy was a “ploy by TRS and the main opposition TDP” to create a constitutional crisis in the state. But, such a course would undermine the cause of Telangana, they argued. The revered seer warned that Maoists would have a “free run” if Telangana state was created. “All Telugu speaking people should remain united. Any division of Andhra Pradesh will be disastrous,” the seer told reporters in the coastal Andhra city of Guntur today when his opinion was sought on the ongoing Telangana movement. Expressing himself against the proposal to split the state, he said the present agitation was “inspired by politicians” and the general public had no interest in the issue. “It is wrong to create regional divisions among the people. The studies and careers of students should not be disrupted in the name of parochial politics,” the head of Kanchi Kamakoti Peetham said. The Telangana Rashtra Samithi (TRS), which is in the forefront of the statehood agitation, condemned Kanchi seer’s public comments on Telangana and said that it would be better for him to confine himself to spiritual activity. A special Cabinet meeting was called to formally endorse the speech that reiterated New Delhi’s position that it is willing to engage Pakistan if it stopped terror groups from using its territory for launching attacks against India. Several ministers, including Kapil Sibal, Salman Khursheed and Farooq Abdullah, raised questions about the formulation and suggested an alternative. However, they were silenced when the PM intervened to tell them that he had already made such a statement in Parliament several times. He was supported by Finance Minister Pranab Mukherjee and external affairs minister SM Krishna. The UPA government has come under tremendous pressure over its offer of talks to Islamabad after the Pune bomb blast which is believed to have been masterminded by Pakistan-based terror outfits. The BJP has opposed the resumption of dialogue with Pakistan, saying “terror and talks” cannot go hand in hand while senior BJP leader LK Advani suggested that India was nudged in this direction by the US. The Opposition is all set to corner the ruling combine on this issue in the upcoming Budget session. The President’s speech, which actually sets out the government’s agenda for the coming year, is learnt to have taken note of the failed monsoon and rise in prices and has also given details on the steps it has taken to bring down food inflation. Last year’s Presidential address had laid down the UPA’s five-year agenda since it was the first speech after the ruling combine’s unexpected return to power. UPA sources said the government had essentially reiterated its promise to deliver on its stated commitments, especially its flagship programmes like the rural employment guarantee scheme, Bharat Nirman and new initiatives in education and health. The extension of visa came a day before its expiry, relieving the 46-year-old author of tension about her future stay in India, her “adopted” home since leaving Bangladesh in 1994 in the face of death threats from fundamentalist groups against her alleged blasphemous writings. This time, the gun in its upgraded and more powerful avatar, is not owned by the controversial Swedish firm - Bofors. Its ownership has changed hands and now the BaE Systems owns the license to produce the gun that is code named ‘FH77 B05 towed howitzer’. This is a 52 calibre gun that is an upgraded version of the earlier 39 calibre, 155 mm gun purchased by India 25 years ago. The BaE has arrived in India in a joint venture with Mahindra & Mahindra, the vehicle maker. At the unveiling of their stall yesterday, vice-chairman of Mahindra & Mahindra Anand Mahindra told reporters, “The gun is innocent”. His reference was towards the 25-year-old controversy that had dodged the Rajiv Gandhi government in the late 1980s. “The controversies are things of the past… The gun defended the country admirably during the Kargil conflict,” he said. Sources in the Ministry of Defence said the Mahindra-BaE gun will participate in field trials. Facing it will be the “IFH2000 155mm 52 calibre” made by Singapore Technologies, which in collaboration with Punj Lloyd is setting up a plant in Madhya Pradesh. Chief marketing officer of Singapore Technologies Brig Gen Patrick Choy said, “We are here to stay”. The Singapore technology gun is also on display at the DEFEXPO and the two companies are readying themselves to face each other. The trials that were slated to start late this month have been postponed by a month following a request by the Singapore Technologies. The Army is slated to purchase some 400 pieces of the towed artillery gun and more will be manufactured in the country under the transfer of technology agreement. Notably, ever since the Bofors controversy broke out, India has not purchased any artillery gun and the existing guns are running short of the growing demand. Rather field units of the Army have been “cannabalising” the guns to keep the other guns in operations. Field trails had been conducted in the past, however, each time the tender used to be cancelled, as nobody in the government wanted touch the “Bofors” guns. Now, the government after modification of its policy has allowed foreign participation with Indian companies. BAE Systems will be co-located with Defence Land Systems India of the Mahindras. The joint venture will be up and running at its Faridabad plant, as announced by BaE. Chief of the Army Staff, Gen Deepak Kapoor, visited the headquarters of Western Command at Chandimandir today. Gen Kapoor was received by Lt Gen SR Ghosh, the GOC-in-C of Western Command. Lt Gen Ghosh later briefed the Army chief on various operational training and administration matters. The Army chief, who retires at the end of next month, later interacted with officers and jawans posted at the station and inquired about various welfare activities. He was accompanied by Kirti Kapoor, the president of Army Family Welfare Organisation, according to a statement issued here. Spokesman of Bengal-Jharkhand-Orissa Border Regional Committee of CPI(Maoists) Rakeshji said the outfit had extended the deadline till 6 pm tomorrow for the government to fulfil their demands to release Prashant Kumar Layek. The major resistance, it is learnt, was to the IIT demand that they be allowed complete autonomy to offer undergraduate or postgraduate medical courses, free from the Medical Council of India (MCI) norms. “There was no agreement on this issue. Obviously, the new institutes offering medical courses should be ready to subject themselves to the MCI regulations. The IITs sought a go-around on the regulation bit,” member of the expert committee said on the condition of anonymity. The IITs had sought statutory institute status as is currently granted to AIIMS; PGI, Chandigarh; JIPMER, (all three under the Health Ministry) and Sri Chitra Trinunal Institute for Medical Sciences and Technology, Thiruvananthapuram (under the Ministry of Science and Technology). Of these institutes, JIPMER and AIIMS offer both UG and PG medical courses while the PGI, Chandigarh, and Sri Chitra Institute offer PG courses. They are the only statutory medical institutes free from MCI regulation. The IITs, which fall under the HRD Ministry, enjoy statutory status in terms of the engineering and technology courses they offer. They sought approval of the Health Ministry to amend the IIT Act to give them autonomy to offer medical courses as well. This, it is learnt, did not go down well with the MCI that wants to regulate medical education in India. The decision is expected to help augment availability of the sweetener and curb its price, considering about 8 lakh tonnes of imported raw sugar are lying at ports due to ban imposed by the Uttar Pradesh government in November on processing them in the state. "In view of the difficulties being faced by importers to move imported stocks to Uttar Pradesh for refining, the government has decided to allow such sugar mills and refineries to make one time sale of such stocks to other mills/refineries," the Finance Ministry said in a circular. The circular, dated February 10, has allowed the UP mills to pass on the reimbursement for additional customs duty to the other mills who intend to buy the imported stock. The procedure would remain in force for the raw sugar imported till June 2010, the circular said, adding that the importers would be permitted to make a one-time sale of raw sugar latest by December 31, 2010. Last month, the Cabinet Committee on Prices had allowed Uttar Pradesh millers to process imported raw sugar in other states but that did not help as refineries in other states were asking for high processing charges. Sugar prices have more than doubled since January 2009. The suspension orders of the nine policemen of the Ghurpur police station, including SO Vinod Dube, were issued by DIG Brijbhushan Sharma. A case of murder has been registered against them. A CB-CID inquiry has been ordered into the incident and a report is being prepared for forwarding it to the National Human Rights Commission. Four alleged “history-sheeters”, including Sanjay Nishad (25) who carried a reward of Rs 5,000 on his head, were brutally beaten up in full public view following which two succumbed to their injuries. The two injured were admitted to Sarojini Naidu Hospital where the condition of Mukesh (30) was said to be critical. According to sources, constable Kamlesh Kumar Pandey was shot at at a beer shop in Mohniya Bazar area under Ghurpur police station on Sunday. Following that, infuriated policemen picked up Sanjay Nigam (30), Mukesh (30), Devanand Goswami (21) and Ashok Nishad (19) and claimed to have recovered a country-made pistol and ammunition from them. They were reportedly tied to a tree and beaten up mercilessly. Around 1.30 pm, SO Dubey brought injured Sanjay to SN Hospital where doctors declared him “dead on arrival”. The panicky policeman dumped the body in the post-mortem room and vanished. An hour later, policemen brought another dead, Ashok, to the hospital in a taxi in a sitting position giving the impression that he was still alive. Around 4.30 pm, Devanand Goswami and Mukesh were also brought to the hospital by the policemen. Mukesh was in a critical condition, while Goswami was crying out aloud against the police atrocities. Later, relatives of the dead reached the spot and started demanding justice. On coming to know about the incident, IG Chandra Prakahs and DIG Sharma arrived at the scene and got a case registered. A Bench headed by acting Chief Justice MB Lokur, however, turned down his plea and said his petition would be taken up in normal course. However, the joint operation against the Maoists at Jangalmahal, Lalghar, Salboni and elsewhere in Purulia, Bankura and west Midnapore districts would continue as usual till the Maoists were driven out from the areas. But the Shilda (Simplipal area) police camp would be shifted elsewhere due to strategic reasons, said state chief secretary AM Chakraborty. Talking to mediapersons at Writers Buildings, he admitted there were some security lapses at the police camp due to which the Maoists attack could not be prevented. He said the government had asked the joint action force to launch a larger offensive against the Maoists in the area. Home Minister P Chidambaram today talked to Chief Minister Buddhadeb Bhattacharjee on phone and expressed shock and surprise at the incident. He was reportedly dissatisfied that the police had failing so miserably in combating the Maoists. DGP Bhupender Singh visited the area for making an on-the-spot inquiry into the incident. He admitted they had no prior information that the Maoists could launch such a daring attack on a police camp. He said during the operation, the Maoists looted around 40 firearms, including AK-37, LMGs, pistols and a huge stock of ammunitions stored inside the camp. He said three Maoists were also killed in the police firing during the incident but their bodies were carried away by others. Information suggested that the gang operating in West Bengal and Jharkhand was behind the attack. The state police was in touch with the Jharkhand police for tracking down the culprits, he added. The incident occurred when a boiler in the JD Ispat factory exploded due to some “technical problems” in the blast furnace, they said. However, according to unconfirmed reports, 19 persons have been injured in the explosion. All injured have been brought to the city hospitals for treatment. Fire Brigade officials from Nagpur and police officials have rushed to the spot. The two - Stephen Hampston, who is in his mid-40s, and Steve Martin, 55, - were picked up from the Raddison Hotel near the Indira Gandhi International (IGI) Airport on February 13, the police said today. Like Pune, David Headley had also visited Pushkar and had stayed at Hotel Oasis in which he opted for a room facing the road where Chabad House is located, on March 11-12, 2009. In Pune too, he had put up at a hotel near the German Bakery, which too has Chabad House in its vicinity. In view of his movements, armed policemen have been deployed outside the Chabad House, which is near Pushkar bus stand, and also at the main gates of Brahma Temple while the cops in civvies are making rounds of public places to keep an eye on suspicious activities, if any. The police has also set up check posts at different entry points of Pushkar and all vehicles entering the town are being thoroughly checked. IB officials also checked hotels and confirmed the identity of the tourists staying there. Police officials in Pushkar said they are also checking the identity of foreign tourists who are travelling by bus. They are also being asked to produce their I-card, passport and visa. Meanwhile, the police in Rajasthan is taking no chances and massive security arrangements are being made to ensure safety of the tourists. Tourist destinations like Jaisalmer, Pushkar and Udaipur are totally under the police vigil. In Jaipur, police pickets comprising six policemen each have been dispatched to every part of the city. Central intelligence agencies have forwarded to the Goa police a list of places which Headley is reported to have reconnoitred during his visit to the coastal tourism-oriented villages of Anjuna and Arambol, a senior police official told IANS Tuesday. "The list comprises places which Headley is supposed to have visited in Goa. We have already corroborated some of these inputs at the ground level and vigil at these sites has been increased," the official said without naming the places. Following the terror strike at Pune's German Bakery Saturday, security for vital installations in the state had also been increased, Superintendent of Police (Security) Tony Fernandes told IANS. "Dams, oil storage tanks, places of religious worship are now under 24-hour vigilance," Fernandes said, adding that military installations including army and naval bases in the state were also on alert. "There is no specific threat to these vital installations, but we are on a state of general alert," Fernandes said.